This reverse belly bar features a small sterling silver three petal design which is set with black and clear crystals and has a 10mm (3/8") surgical steel barbell. These inverted belly button bars are worn by inserting the design downwards into the navel piercing. 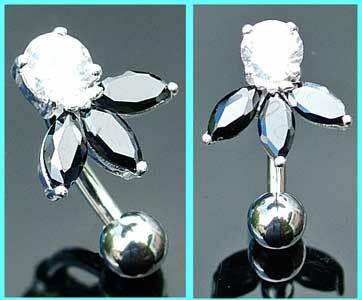 This cute inverted petals navel bar is one of the most popular designs in our reverse belly bars range. The sterling silver flower, which measures 12mm x 12mm is made up of three petals which are set with black crystals, with a single clear jewel making up the rest of the design, and the piece is worn by inserting the 10mm (3/8") surgical steel shaft downwards into the piercing. These reverse flower belly button rings are also available with clear, light blue, pink, light green, sapphire blue, rose, pale lilac, dark green and purple stones. Powered by ShopFactory to sell P10574 online. All-in one eCommerce and online shopping cart software.